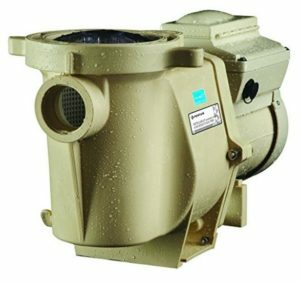 From what I had read and heard about pool pumps prior to making the investment, the Pentair Pool Pump is the Cadillac of all pumps. It took me a while to get my brain wrapped around the features and timer for making the very best use of this product, but after having used it for a summer, I am beginning to agree. In fact, this is one of the best purchases I have made for my pool, right next to the Saltwater Pool System nearly 2 summers prior. Unfortunately, it also took me some time to get my mind wrapped around paying so much for a pool pump. Because my pool is very far and uphill from my pump-room, I tend to be very hard on pumps. My last pool pump cost around $465.00 installed and lasted about 5 years. The Pentair Pool Pump is in a whole new price league. I paid just under $900.00 for it on Amazon . As it turns out concerns over trapping small birds and other animals were not only well-founded, but led to the demise of what seemed like a great idea. After the stories I heard about these, I took extra precaution myself and never did feel comfortable having them in my yard. I decided I would never hang them anywhere, though I have used them low near wasp nests and never hurt a small animal or bird. Apparently, the birds are attracted the bright yellow color just as are the wasps. Birds also see the trapped wasps on the sticky surface as an easy meal. The TrapStik did an amazing job attracting and trapping wasps. Unfortunately, some of the environmental side effects of products like these are not always easy to predict. I applaud Rescue for coming to the rescue of small birds and discontinuing a very effective wasp elimination product. The occurrence may have been rare, but who wants to be one of those rare people trying to remove suffering and/or dead birds from traps? Rescue did the right thing. Now, what can we expect? Rescue mentioned in their press release that their product engineers are working on ways to improve TrapStik to make it environmentally safe. Here is my idea: They should place a transparent, plastic cone with small holes around the same, wasp-attractive, colored, sticky surface. The colorful design would invite wasps to step inside through the holes, while preventing birds from access to touching it. One question I have is whether or not they could improve the design of their other, current wasp traps by mimicking the same colorful yellow and green pattern. The serum alone, did not seem to be nearly as effective in attracting wasps as the colorful surface of the TrapStik. The colors combined with the scent of the serum, I would think, would make them far more effective at getting wasps to come in through the bottom holes. 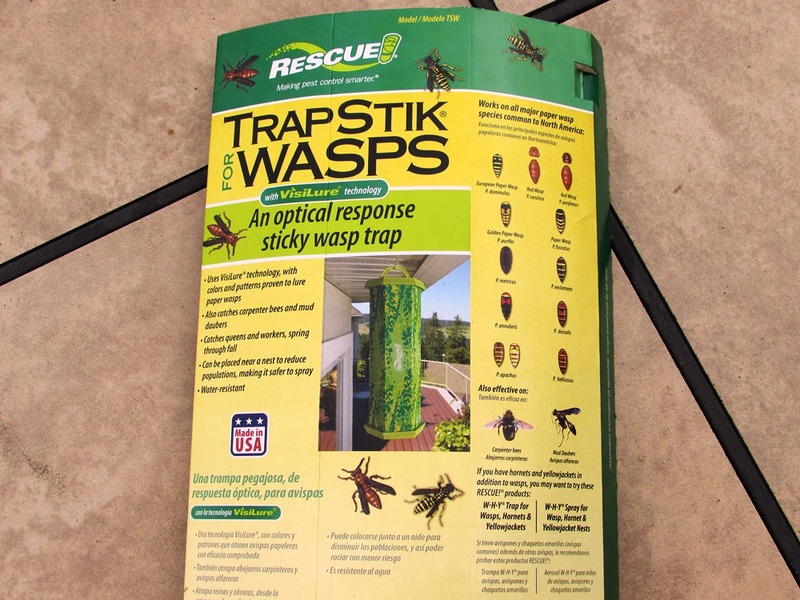 I will keep you updated on the reinvention or improvement of TrapStik as well as other effective products for getting rid of wasps as I hear about them. Wasps in our own backyard continue to be a huge problem for us. How to get rid of wasps is not a one-size-fits-all solution. The answer depends on the type of wasps, location, and situation. I have had great success removing wasps from the row of hedges along side of our swimming pool late in the summer simply by spraying them with a couple of cans of wasp spray. Other times, I was able to control wasps by hanging up a couple of Wasp Traps with Wasp Attractant around the perimeter of the yard. This summer, we had a different problem: Wasps were gaining entry into the bottom of our porch through an open hole. Dozens were coming in by the hour I tried using wasp spray and tried using wasp attractant, but none of these things seemed to make a dent in the wasp population flying in and out of the porch hole. Finally, I sprayed the hole shut with insulation foam. The wasps appeared to not be able to get anymore, but it didn’t stop them from trying. The area was now a complete mess, swarming with wasps who were bound and determined to get inside the bottom of our backyard porch. Finally, I found something that appears to be working. Before I purchased the Kobalt cordless hedge trimmer, I found myself searching for a battery powered chain saw and I’m not sure why. While a cordless hedge trimmer does resemble a gas-powered chainsaw with it’s inch long spikes minus the chain, it is completely different in form, function, and purpose. When I think of chainsaws I think of a heavy duty piece of machinery designed to saw through massive tree trunks. I have a hard time believing any battery powered chainsaw is going to have enough power and endurance to get through a thick tree trunk. The Kobalt 40V lithium powered hedge trimmer comes with 24″ duel action blades that can easily cut through tree branches and trim hedges and shrubs around the home and it does the job far more quietly than a chainsaw. Because it is light-weight, I don’t mind taking the Kobalt cordless trimmer with me up a ladder to prune the higher-up limbs on our trees. It cuts through most tree limbs in one-pass though it is light-weight enough that I don’t have to worry if I miss a few here and there – I simply go over them again. My wife has used our Kobalt cordless hedge trimmer to reshape bushes, hedges and trim an entire row of butterfly bushes along our backyard. The key advantages here are ease-of-use and convenience. It is literally probably more work to clean up the branches and mess afterwards than it is to actually trim and cut down limbs, branches and re-shape rows of bushes. The Kobalt battery-powered hedge trimmer uses the same 40V battery as my other Kobalt Tools: Kobalt Lawn Mower and Battery Powered Leaf Blower. Now, owning all three Kobalt tools, I have more batteries and more chargers than I will ever need. If I have one and only one complaint It might be that Kobalt should offer its customers an option to buy their tools without the battery. The convenience and light-weight operation of battery-powered tools has encouraged me to do a lot of little extra yard work that I normally wouldn’t have done. Whenever I see something around the lawn that needs a little trimming, I know that my cordless hedge trimmer is only the press-of-a-button away from making me instantly productive. If I see a few grass blades on the driveway that I normally would have let go, I don’t hesitate to put a battery in the leaf blower and get them cleaned up. When my grass was growing twice as long in the early summer, I mowed more frequently than I normally would have thanks to the easy, light-weight operation of the Kobalt Battery Powered Lawn Mower. 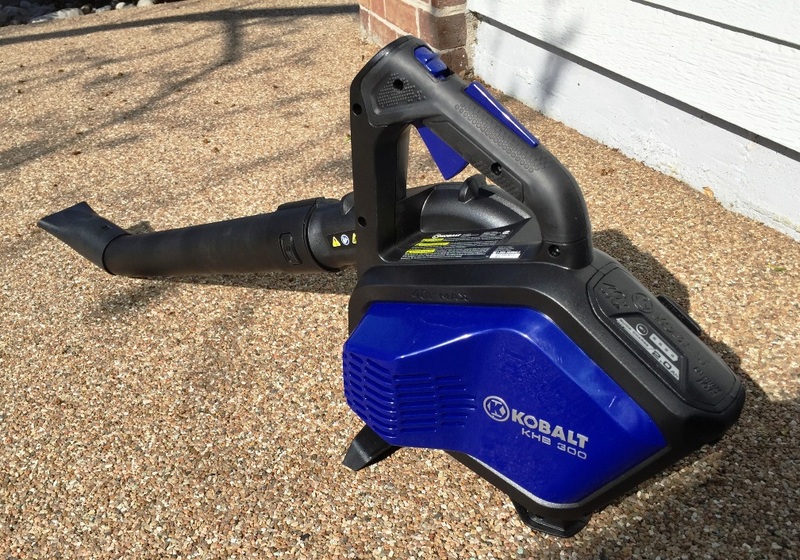 If you are really into keeping a neatly groomed lawn and garden, I cannot recommend the Kobalt cordless hedge trimmer enough. On the other hand, if you don’t care much for doing yard work and extra trimming around the house, that is probably the best reason of all to get a cordless hedge trimmer. Convenient – no cords. Quick charge. Affordable for a lithium ion re-chargeable tool. Light Weight and small for portable, easy storage. Easy to Handle – nice ergonomics. Weaker air flow than with other corded and gas blowers – Only good for grass blades, leafs and other light-weight, dry debris. Kobalt forces you to buy both the battery and charger whether you need them or not. With my hedge trimmer and mower, I have more than I can use. The Arnold power rake is a dethatcher blade specifically built for 21″ and 22″ push-behind, lawn mowers. The purpose of a power-rake, of course, is to ease the pain and burden on your back and hands associated with manually raking up your dead grass and thatch. A good power rake is a tool that can be rented from an equipment shop and costs hundreds of dollars to buy. A power rake or dethatcher blade is a very inexpensive part that you replace with your lawnmower blade in a matter of minutes. The Arnold power rake, unlike other dethatcher blades which use metal tines, has a number of rigid, orange plastic tines which are spread out across the length and width of the dethatcher blade. The plastic tines, according to user reviews, do not risk doing as much damage to the lawn as the traditional, metal-tine dethatcher blades. There are other dethatcher blade sizes made by Arnold, but the 21-22″ size is probably the most common and happened to be the one that fits both of my lawn mowers. As you can see by the photo, the Arnold power rake is quite a bit different than most dethatcher blades. I bought this blade because it got better ratings from users than the traditional thatcher blades. Why Power Rake Your Lawn? I can see a couple of good reasons for power-raking your lawn as opposed to doing the manual, back-breaking, old-fashioned, annual, Spring hand-raking. One, after the dead cold chill of winter, spring raking becomes necessary for removing the dead grass and debris from the grass and giving your lawn plenty of fresh air and room to breath and produce new, green grass. My north-facing front yard happens to face the brutal cold winters of Colorado. Not only is the climate hard on the grass, but the debris and salt from shoveling snow off the driveway gets left on the lawn. It is going to take more than hand-raking to clean up the harmful substances on the lawn, even if it means mowing at a very low setting. It becomes absolutely necessary for me to rake up the dead grass and remove the harmful chemicals and soot from the driveway as efficiently as possible. The second reason is that hand-raking is never as easy as it looks and usually turns into a seemingly endless job. Whenever I begin my spring lawn raking, I always tell myself, I will just concentrate on the dry spots and won’t bother to even rake the areas that are already green. Once I get started, I can never seem to stop. There seems to be an endless amount of thatch to remove and once I get done with the dry spots, I feel as though I’ve neglected the rest of the lawn that is green. So, I usually end up raking the entire lawn and it becomes very tiresome after a while. Getting started with a rake is easy, but finishing the job is not. The Arnold rake makes it possible to bypass the rake entirely. The job is as easy as mowing your lawn once or twice. The final reason, of course, is that a good, professional power rake will do a much better job than human, back-breaking, manual hand raking. So, the question then becomes, ‘can a simple replacement dethatcher blade do a better job than you can do with your old fashioned rake? I decided to look at power rake reviews and the one that looked the best was, Arnold.